Shortfin mako shark (Isurus oxyrinchus), splendid raider already described in 1952 by E. Hemingway in a touching conflict between man and animal, currently result to be one of the fastest and powerful known sharks.. This animal succeeds in ploughing the seas to the unbelievable speed of 70 km/h and to escape from the water with leaps that lift him completely up to 5 meters! The jumps are often observed when the shark is captured to the hook, during the commercial of sporting fishing and the shark tries real stunts to recover the liberty. 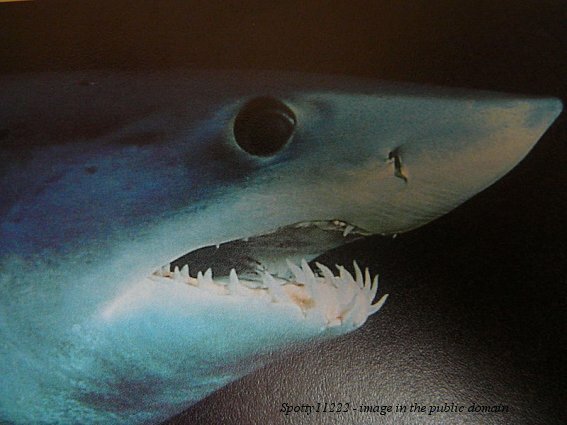 (the world population of shortfin mako shark is in continuous decrease because of the commercial and sporting fishing) Another motive for which often the shortfin mako shark jumps out of the water is to try to free himself from the parasites (crustacean) that stick on its skin, sometimes eye visible. Despite these dangerous enemies, natural and not, this shark continuous to dart in tropical and moderate waters, with superior temperature to the 16°C. It is normally found far from the coasts, in deep waters, up to 150 m, but not rarely draws near to the shores and the continental coral barriers. Adult samples have also been sighted in as soon as 3 m of water (Red Sea). The shorfin mako shark, as already mentioned, has great power, that brings him to attackg great and fast preys as tunas, sword fishes, dolphins and other sharks. The form of the teeth is triangular, with the point oblique slightly perfect to snap and to dismember great portions of meat. The dimensions complete this great aggressive potential, with a middle length from 200 to 250 cm, up to 400 cm and a weight superior to 500 kg! This shark potentially reenters among the 5 more dangerous sharks for the man, together with the white shark (Carcharodon carcharias), to the tiger shark (Geleocerdo cuvier), to the zambesi shark (Carcharhinus leucas) and to the oceanic white tip shark (Carcharhinus longimanus), being responsible of some not provoked attachs to the man. We finally remember that that the 50% of the sharks don't overcome the meter of length, 82% don't overcome the 2 meters, and only 4% reach superior dimensions to the 4 meters, such to represent a serious danger. 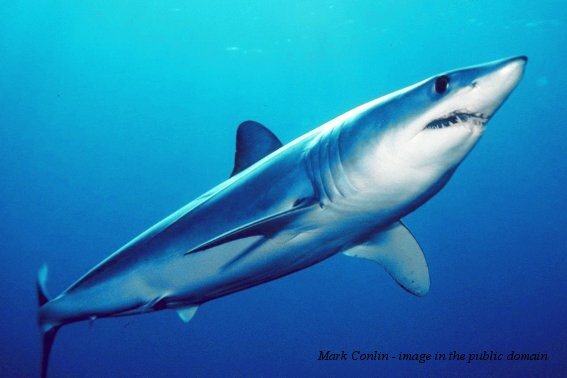 The shortfin mako shark has a particularly rigid and hydrodynamic body, elements that help to reach elevated speeds. Also contributes to this the great caudal fin, with both the lobes developed. The face is pointed and the pectoral fins small. The eyes are great and black and the teeth often in evidence. The shortfin mako shark, as the white shark (Carcharodon carcharias) has developed a mechanism of maintenance of the heat that allows him to have a bodily temperature of 4 - 5 °C superior to that of the water that surrounds him and up to 10C° as it regards the most inside musculature. This mechanism, the so-called "rete mirabilis", give a greater reactivity of the musculature, great benefit to the shark as regards the times of digestion of the preys, that result faster, immediately making available for the animal great quantity of energy. The reproduction is viviparous without placenta, and the small sharks during the birth have dimensions that go since 60 to the 70 cm. Distribution: tropical and moderate waters, from the Atlantic to the Indopacific ocean. Coloration: blue-grey back, white abdomen. Compare with the man: potentially very dangerous. Commercial value: object of sporting and commercial fishing to use its meats. Teeth: triangular, narrow, smooth, with oblique point; very similar in both the arcades. Note 1: Isurus oxyrinchus, described the this article it is very similar to Isurus paucus, that has the pectoral fins longer and least pointed nose.